Subscription boxes have been popular for awhile now and I love that there are so many different ones available. Today I'm sharing with you a subscription box that is ideal for coffee lovers like myself. 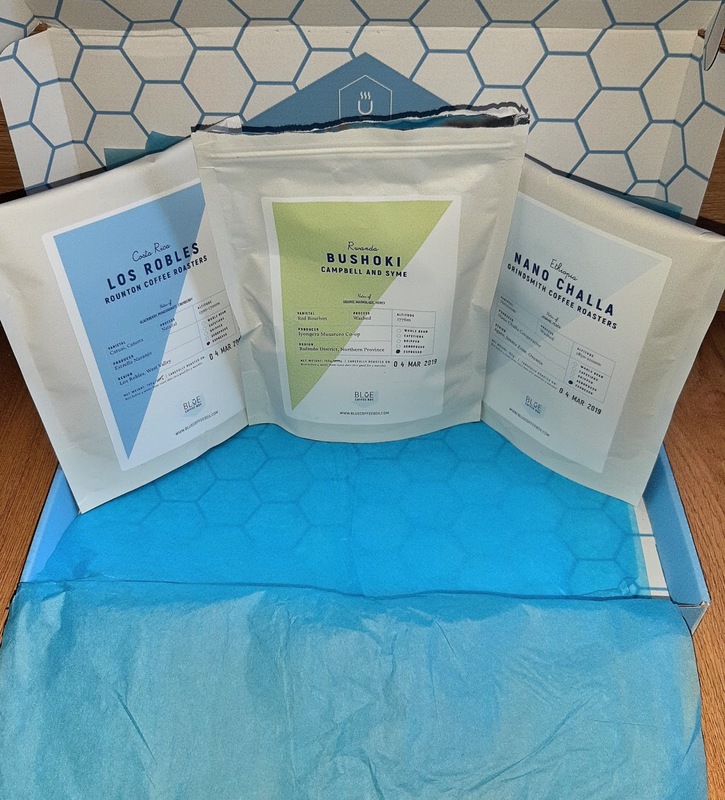 The Blue Coffee Box is the UK's best gourmet coffee subscription service. Not only will you get luxurious gourmet coffee delivered to your door, you will be tasting ethnically sourced specialty coffee. 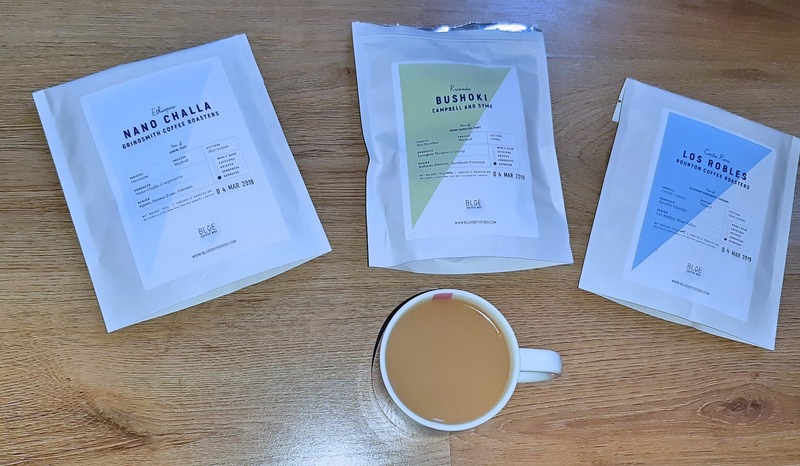 With a Blue Coffee Box subscription each month you will receive a letterbox friendly box containing 3 bags of freshley roasted coffee along with tasting notes and information about the origin and farm where it is produced. Three new roasters are introduced every month from the top of the UK’s 300 or so craft roasters to hand-roast the beans. These are fresh roasted every week and members can select how they are prepared; whole beans or ground for cafetiere, dripper or espresso. Membership costs from only £7.99 per month (or less for 3, 6 or 12-month advanced payment). Members can cancel, pause, skip or upgrade at any time. Founders Jon and Harvey kindly gifted me a box to try out. As someone who loves my coffee and is unable to get through a day without a mug or two, Blue Coffee Box is great treat. I opted for the espresso ground coffee box which is suitable to be used in espresso machines and stove tops. You can choose others though such as beans to grind, cafetière coarse grind, medium grind for pour overs and filter droppers. You also get to opt for light medium or dark roasted coffee depending on your taste preferences. I opted for light which is light in colour with no oil with more flavour and more caffeine. You can also if you wish opt for a surprise which tends to be the most popular option. I was excited when my box arrived as it was so perfectly packaged. I love it when companies make an effort with packaging without being over the top and Blue Coffee Box do this well. It's conveint too as the box is suitable to go through your letter box and you get a good amount of coffee for your money too. The pouches are practical as well as they can be resealed after opening. Each pouch gives information on such as tasting notes, variety, process, altitude, producer, region and even the date the coffee was roasted on. If you think that all coffee tastes the same you are wrong. I could definitely taste the difference between the varieties and my favourite has to be the Bushoki which was in fact the first one I tried. It's not at all bitter in taste in fact it's smooth with a sweet and deep flavour to it. Saying that I enjoyed the others too and love the aroma of the coffee sin the mornings.